These 100 best-loved recipes served at Chef Pano�s award-winning Atlanta restaurant, Kyma, showcase his inspiration: paying homage to the flavors and traditions of Greece, and to the wealth of insight about Greek cooking passed down from his grandmother; his classical French training, and even a touch of his Southern roots. 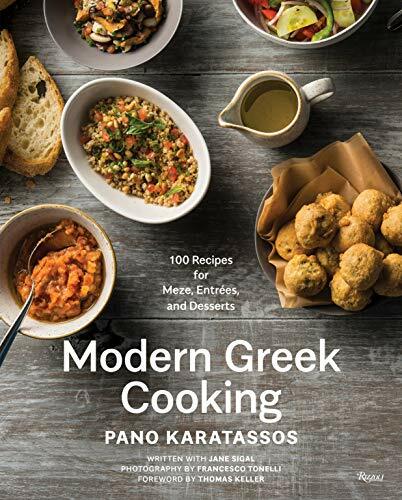 The 100 dishes are Chef Pano�s updated takes on Greek flavor combinations and ingredients. Meze include Spicy Red Pepper Feta Spread; Grilled Eggplant and Walnut Spread; Steamed Mussels with Feta Sauce; Braised Octopus with Pasta and Tomato Sauce; and Lamb Phyllo Spirals. Entrees showcase seafood in Braised Whole Fish with Tomatoes, Garlic, and Onions and Olive Oil�Poached Cod with Clams and Melted Leeks; as well as meat dishes such as Grilled Lamb Chops with Greek Fries. Manouri Cheese Panna Cotta, Semolina Custard and Blueberry Phyllo Pies, and Hazelnut Baklava Sundaes are among the desserts. Accompanying the dishes are approximately 60 full-color photographs by renowned food photographer Francesco Tonelli. Greek wine expert Sofia Perpera provides the wine pairings.